Yoga Tidewater Therapy provides a variety of unique wellness services to the Hampton Roads and OBX communities. 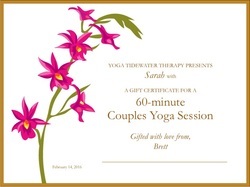 Yoga Tidewater Therapy offers a variety of wellness services to the Hampton Roads and OBX. helping individuals facing health challenges at any level manage and improve their condition. Reiki is a spiritual healing art with its roots in Japanese origin. The word Reiki comes from the Japanese word (Rei) which means “Universal Life” and (Ki) which means “Energy”. Reiki is not affiliated with any particular religion or religious practice. It is not massage nor is it based on belief or suggestion. It is a subtle and effective form of energywork using spiritually guided life force energy. Reiki is the life energy that flows through all living things. Reiki Practitioners understand that everyone has the ability to connect with their own healing energy and use it to strengthen energy in themselves and help others. It is believed that a person’s “ki” or energy should be strong and free flowing. When this is true a person’s body and mind is in a positive state of health. When the energy becomes weak or blocked it could lead to symptoms of physical or emotional imbalance. A Reiki session can help ease tension and stress and can help support the body to facilitate an environment for healing on all levels – physical, mental, and emotional. A session is pleasant and relaxing and is often utilized for one’s personal wellness. This explanation comes from the International Association of Reiki Practitioners.